Bad Dream were a BattleMech based Mercenary Company that formed during the early Succession Wars. By 2800, the Capellan Confederation and Draconis Combine shared an active border, as a result of the annexation or conquest of numerous former Terran Hegemony systems, both during the final years of the Star League era and following the eruption of the First Succession War - while the Federated Suns staggered under the massive invasion launched by the Draconis Combine Mustered Soldiery at the start of the war. Raids between DCMS and Capellan Confederation Armed Forces units across their mutual border had been relatively common, but in 2800 the DCMS began launching full-scale invasions of Capellan-held worlds. One such world was Ronel. When the Thirty-fifth Dieron Regulars struck at Ronel, the garrison consisted of the Ariana Grenadiers and two regiments of sealed armor, recently deployed to the planet from Demeter. The Grenadiers were still trying to adjust to the higher gravity of their new garrison world, as well as the more desolate landscape, and rapidly found themselves on the defensive. In a decisive battle in the gnarled forests near the city of Lenor, the Grenadiers were left disorientated and disorganized by a combination of incendiary artillery and smokescreen rounds, and the DCMS capitalized on this by striking with aerospace forces, wiping out half of the armor forces in a matter of minutes, forcing the Grenadiers to pull back - but the retreat turned into a rout, as the Grenadiers were swiftly reduced to little more than a battalion of 'Mechs. Under fierce fire from the pursuing DCMS forces, some survivors managed to make it off world, but a battalion of armor and assorted Grenadier 'Mechs were left on Ronel. Those survivors quickly re-branded themselves as a new mercenary command, the Bad Dream, either under coercion from the DCMS or out of the belief that that Strategios had sent them to Ronel as sacrifical lambs, and the newly-formed mercenary unit immediately accepted a contract with the DCMS in 2802. Initially an under-strength battalion, the Bad Dream grew to become a full BattleMech regiment with conventional support in the form of a full aerospace fighter wing and two battalions of armor over the course of the First and Second Succession Wars. The Bad Dream mainly served the Draconis Combine and the Federated Suns until 2866, when they were hired by the Lyran Commonwealth as a part of Elizabeth Steiner's campaign to hire mercenary units in the lull between the Second and Third Succession Wars. The Lyran Commonwealth had an urgent need for light and medium units at this point due to the destruction of the Stealths in 2863. This prompted the hiring of the Bad Dream, along with other units such as the Blackhearts. The Bad Dream were initially deployed primarily as raiders harassing the Free Worlds League, which prompted the unit to invest in purchasing DropShips and JumpShips for themselves. Yet as their contracts with the Lyran Commonwealth were extended or renewed, the Bad Dream found themselves spending more and more time defending the world of Newtown Square, close to the Draconian Rift at the edge of Lyran space. The slowing pace of warfare in the closing stages of the Third Succession War left the unit sliding further and further into debt. As the Lyran Commonwealth prepared for the Fourth Succession War in 3028 the Bad Dream were moved from Newtown Square to Kobe before getting the chance to go on the offensive again in the first wave of Operation GOTTERDAMMERUNG. The Bad Dream successfully seized Heiligendreuz in the first wave of attacks before being deployed against Gunzburg. The Bad Dream and Mobile Fire were both dropped on Gunzburg to face the 22nd Rasalhague Regulars. It took the two mercenary units two months to pin the 22nd down in an ambush, but their eventual defeat was an embarrassing event for the Draconis Combine - despite Gunzburg being a secondary target for the Lyran Commonwealth. Unlike the Fourth Succession War, the Bad Dream were not deployed in the War of 3039. Instead the unit spent the duration of the war on Newtown Square. Heavily in debt by the time the War of 3039 arrived, the Bad Dream broke their contract with the Lyran Commonwealth during the war and headed for the Free Worlds League. The League were happy to hire the Bad Dream, putting them in place on Landfall, one of the League worlds bordering the Illyrian Palatinate. While this quiet deployment gave the unit a steady income it also eroded their combat skills to the point that when Henry Bortman became CO of the regiment in 3048 the members were growing apart, and the unit was largely stagnant. The Bad Dream were still on Landfall in 3048 but by 3054 their remit had expanded to include Kendall, guarding the Kali Yama - Alphard Trading Corporation BattleMech plant producing the Orion as well as a Brooks Incorporated plant. By 3059, the Bad Dream had been guarding either Kendall, Landfall or both for more than 15 years, avoiding Operation GUERRERO and the resulting mayhem that erupted in the Chaos March. In 3062, the debt that the Bad Dream thought they had escaped when they absconded from the Lyran Commonwealth in 3039 returned to haunt them. The Mercenary Review and Bonding Commission summoned representatives from the union to explain the debt that the Lyran Alliance had inherited from the Lyran Commonwealth. After reviewing the details, the MRBC adjudicated in favour of the Lyrans. The Bad Dream were able to negotiate repayment terms that allowed the unit to keep the bulk of its critical combat equipment, and were thus forced to sell off all of their Aerospace fighters, JumpShips and all but one of the unit's DropShips. This left the Bad Dream heavily reliant on employers for transport and technical support. The Bad Dream were still on Kendall when the Jihad broke out and remained a viable fighting formation despite their lack of transport assets. The Bad Dream held true to their contract as the initial waves of conflict and upheavel spawned by the Jihad struck the Free Worlds League, and they continued to serve the government on Atreus. When Thomas Marik was deposed, Colonel Bortman went so far as to state that his command would continue to honor their signed contract with the "lawful government of the Free Worlds League". During 3070 the Periphery border region garrisoned by the Bad Dream for the last 30 years experienced a sudden upsurge in pirate activity, causing the Bad Dream to be heavily occupied in fighting both pirates and Marian raiders. Despite the loss of a company of 'Mechs from the first battalion when the Brooks Incorporated plant was attacked on Kendall, the Bad Dream were able to quickly replace their losses through generous support from outside agencies including companies suspected of having ties to the Word of Blake, prompting calls from the MRBC for an investigation. Late in 3071, the combat strength of the Bad Dream was severely damaged, not from enemy attacks but from mass defection. The Nightcrawlers armor forces broke away from the Bad Dream, along with two companies of MechWarriors. Those leaving formed a separate mercenary command, the Nightcrawlers, on Galatea. Colonel Bortman claimed that those who left did so due to philosophical differences, although rumors on Kendall at the time dispute this. By 3079, the Bad Dream was a shell of its former self. Following the mass defections in 3071 and the upsurge in combat activity in their region, an attack from the Marian Hegemony in 3077 shattered and effectively broke the remains of the unit. Reduced to just a handful of 'Mechs and shattered in an embarrassing defeat, the Bad Dream responded to the government of Kendall refusing to compensate the unit after their poor performance by breaking contract. The Bad Dream arrived in the Rim Commonality region of the Free Worlds League looking to rebuild just in time to be hired by the Commonality who were desperate for any sort of military force to protect it. The Bad Dream were still garrisoning Lesnovo when the 4th and 9th Marik Militias arrived to garrison the Rim Commonality. At some point between 3079 and 3081 Colonel Bortman dissolved the Bad Dream, selling their surviving 'Mechs to the Rim Commonality government before formally disbanding the unit. By 3067 Bortman was leading the Bad Dream largely in name only. The most capable leaders within the unit were Lt. Colonel Yusef Lochsmitt, the CO of the Nightcrawlers, and the various company commanders through the regiment. By 3067 the Bad Dream 'Mech forces relied primarily on the most basic and least surprising tactics and strategies in battle. The Nightcrawlers had worked much harder to maintain their skills at this point, and were masters at tactics based on overrunning the enemy, moving through and disrupting opposing formations. In 3071, following the defection of the Nightcrawlers and a successful bandit attack on the Brooks Incorporated plant on Kendall, the need for more aggressive and creative tactics was clear. From the Third Succession War through to 3062, the Bad Dream had their own transport vessels as well as technical support. That changed when the MRBC upheld the Lyran Alliance claim against the regiment, reducing them to the Triumph class DropShip used by the Nightcrawlers and almost no organic technical support. - At this point in time the Bad Dream were a medium-weight unit stationed on New Wessex and operating at just below three-quarters of full strength. 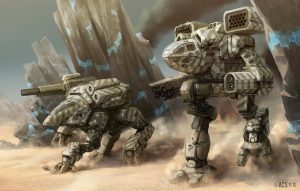 Note: - In 3025, the Bad Dream were a medium-weight BattleMech regiment who owned their own DropShip and JumpShip assets and had both armor and heavy Aerospace fighter support, but they were already in debt to the Lyran Commonwealth. Note: At this point in time the unit was stationed on Landfall. In 3067, the Bad Dream 'Mech regiment was still predominantly a medium weight regiment, as it had been for centuries; while the CO's command lance made up of fast heavy 'Mechs, the rest of the regiment were predominantly medium 'Mechs with a few lights and heavies mixed in. Predominantly a medium weight armor unit, the Nightcrawlers worked hard to maintain their high level of excellence, and were a disciplined and well-equipped unit highly loyal to each other. In 3067, the Bad Dream were operating at 105% of the usual unit strength, and 85% of the regiment had been upgraded with Star League-era technology. 15% of the unit were equipped with OmniMechs. In 3079, the Bad Dream were operating at 20% of full strength, but 100% of the surviving elements of the unit had been upgraded with advanced technology. Bad Dream 'Mech units suffer a -1 initiative penalty for every one of their battalion commanders (Majors) involved in the combat. If Colonel Bortman is leading (the unit must be designated as such before the start of any scenario) and the controlling player must roll a d6. On a result of 4-6, Bortman has had a bad night and inflicts and additional -1 initiative penalty on the unit. On a result of 2 or 3, Bortman has had an uneventful night which has no net effect on the unit. If the result is a 1, Bortman has had a good night and cancels all of the initiative penalties from himself and any other battalion commanders, as well as adding a +1 initiative modifier. If Colonel Bortman is leading the unit and Bad Dream casualties ever outnumber those inflicted on the opposing unit by a factor of two to one or more, Bortman orders an immediate retreat. The Nightcrawlers may choose to roll their initiative separately from the rest of the Bad Dream; if they do so, then they should be treated as a third force during the movement and weapon attack phases. Note: this doesn't apply after the defection of the Nightcrawlers in 3071. If the Nightcrawlers are the only force deployed in a scenario they gain a modified version of the Overrun Combat special ability; they may move one unit for every point by which their initiative result exceeds that of the opposing force. Note: this doesn't apply after the defection of the Nightcrawlers in 3071. ↑ 1.0 1.1 First Succession War, p. 35, "Those Left Behind"
↑ 2.0 2.1 2.2 First Succession War, p. 82, "Caught in the Capellan Crossfire"
↑ 3.0 3.1 3.2 3.3 3.4 3.5 3.6 3.7 3.8 3.9 Mercenaries Supplemental II, p. 21. ↑ Jihad: Final Reckoning, p. 92, "The Rim Commonality"
↑ 16.0 16.1 First Succession War, p. 136, "Mercenary Combat Commands (DCMS)"
This page was last edited on 4 April 2019, at 16:03.